Have you ever had (or even heard of) all natural, low sugar, high protein, high fiber, gluten free, dairy free, vegan, and 100% healthy RED. VELVET. FUDGE?? Well, if you haven’t made these Healthy Red Velvet Fudge DIY Protein Bars, then I’m betting you haven’t. First of all. Yes, Healthy Red Velvet Fudge exists. It’s staring you in the face right now. Second. You will fall in love with this stuff SO HARD that after you try it, you’ll wonder how you ever lived without it. You would never ever know that these Red Velvet Fudge DIY Protein Bars are actually good for you. It tastes just like any other chocolatey fudge — it’s sweet, it’s rich, it’s flavorful, it’s fudgy. BUT, the big difference? This is good for ya. It’s naturally red (no artificial food coloring here), low in sugar (no white sugar here either), gluten free (yup, no bleached white flour), and vegan too. I swear you’d never know it, though. You would never ever know that these Red Velvet Fudge DIY Protein Bars are actually good for you. It tastes just like any other chocolatey fudge -- it's sweet, it's rich, it's flavorful, it's fudgy. Preheat your oven to 350 degrees Fahrenheit. Rinse and gently scrub two fist-sized beets. Wrap them completely in foil, place on a baking sheet, and bake for ~1½ hours, or until a fork pierces through with ease. Let sit until it’s cool enough to handle, then carefully unwrap the foil. Use a butter knife to scrape o the beet skins (they will fall off easily). Chop the beets into chunks and place in a food processor. Puree until completely smooth. Scoop the mixture into the brownie pan and atten it out. Tightly cover the pan with plastic wrap and refrigerate overnight. Place a silicone baking mat on top of a jelly roll pan and line the protein bars on top. 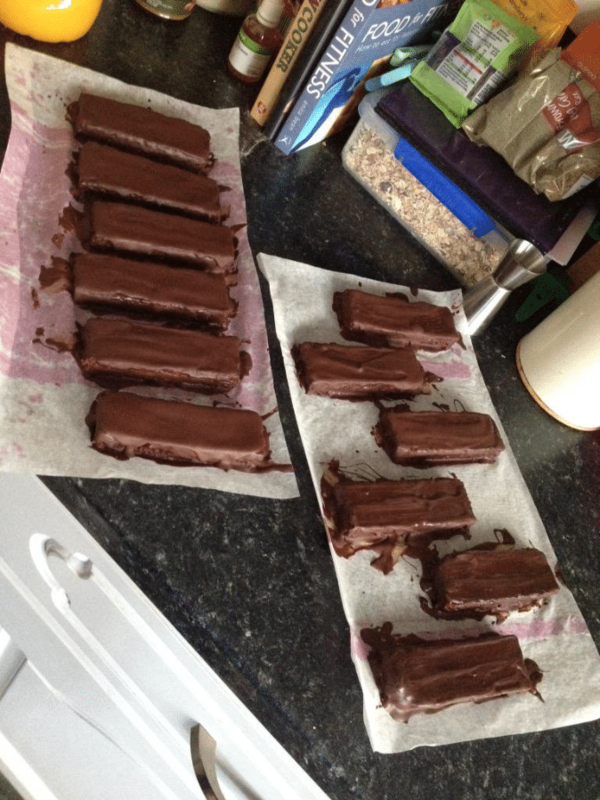 With a large spoon, ladle the melted chocolate over the protein bars. Try to encase the entire protein bar with chocolate, but it doesn’t have to be perfect. Refrigerate until firm (~1 hour). Individually wrap the protein bars in plastic sandwich baggies. Store in the refrigerator for up to 1 week or stash them in the freezer. I am so blessed to be a part of such a loving, adoring, and supportive online community. 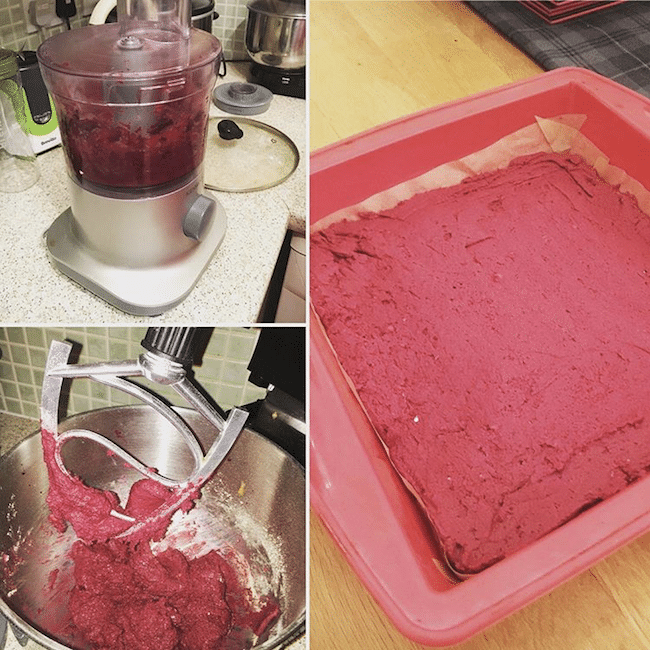 Here are some of the pictures readers have shared with me on social media and via email of their Red Velvet Protein Bar remakes! Watch Gabby make my protein bars! 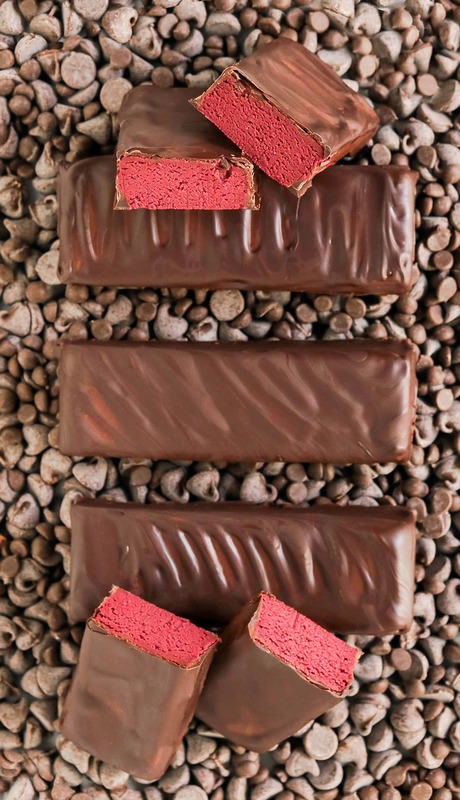 You gotta make these Healthy Red Velvet Fudge DIY Protein Bars ASAP!! I love how you use beets instead of food coloring! I am baking some today! Wow, these bars not only look yummy, but they’re beauties! The only thing missing is Stevia in the Raw. I checked the link and some people really seem angry that this stevia is full of fillers. What’s your take on this? Is it to help bulking the recipe? Would just liquid stevia extract would do? Stevia in the Raw is not full of a bunch of random ingredients, just maltodextrin and stevia. One reason I used Stevia in the Raw in this recipe is because I found out a lot of my readers were using Splenda (sucralose) which is artificial/manmade, unlike stevia and maltodextrin. I would rather have my readers (and myself, my family and my friends) eat natural foods rather than artificial foods. The last reason I used Stevia in the Raw is because it’s cheaper than the liquid stevia extract I usually use, is more widely available, and is easier to find. If you use liquid stevia extract I would recommend using 3/4 tsp. Hope this helps! Love the bright, vibrant red color! I find it really difficult to get hold of a couple of the ingredients you used, but you have no idea how much I want to eat this, that I may just embark on an Amazon shopping trip! I am allergic to oats! Do you think I could substitute a protein powder or coconut flour? Thankfully this is a no-bake recipe so most flours can replace the oat flour, I just find that oat flour has a cake-like flavor in certain applications. 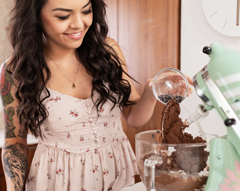 You can replace the oat flour with brown rice flour, sorghum flour, almond flour or more chocolate brown rice protein powder (approximately 3-5 extra scoopfuls worth, or however much until you reach that fudgy cookie dough texture). 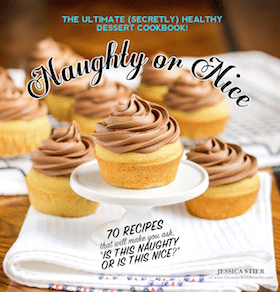 Usually when one ingredient in a recipe is high glycemic I balance it out with other ingredients that are low on the glycemic index, like nut butters, oat flour, cocoa and chocolate brown rice protein powder. Healthy fats, complex carbohydrates, fiber and proteins digest slowly within the body. If the stevia in the raw is a concern, you can replace it with 3/4-1 tsp of liquid stevia extract. Hope this helps, and I hope you like the recipe!! The color of the protein bars is really good and gives a treat to eyes. Its nice to know that these protein bars come with a good texture and different flavor. These look fantastic! I just made your red velvet brownies and it’s delicious! 🙂 I was just wondering if I could replace the protein powder with Whey Protein Concentrate? If so, should I substitute an equal amount or different? Thank you! As for the whey protein substitution, I’m afraid it won’t work 🙁 For some reason whey protein doesn’t solidify and it turns all gooey. I’ve tried making whey protein bars (without liquid sweeteners like honey or agave) for so long but every batch seems to fail! Just wondering as I do craft shows, festivals all over the south east every weekend selling homemade fudge, but things don’t seem to be going very well as they used to be and found that people just don’t want it as they are dieting!! And i wanted to come up with a new idea on a healthier fudge of which i came across your fantastic site. Would you be able to supply us with a number of different types wholesale?- etc the fudge protein balls, peanut butter fudge, red velvet fudge? If you could it would be fantastic as there isn’t any other stalls that have this type of food on! I think it would be a big seller. Look forward to hearing from you. I think it would be great to provide you with the various fudges I’ve made, though, I think they are best served fresh (and I’m not sure how they would ship since they require refrigeration). Also, because they’re sugar-free and preservative-free, they won’t last weeks and weeks like typical fudge. I think my most popular fudge recipes include my Healthy Homemade Chocolate Peanut Butter Fudge Brownie Protein Bars and my Healthy Peanut Butter Fudge Protein Bars. I would recommend trying those out at home, make any adjustments you like (such as adding 1 tsp of vanilla paste or a handful of chocolate chips) and bring them to your shows! Pingback: 40 Recipes For All Your Mermaid Rainbow Aesthetic Needs | Everyfoodrecipes, cooking tips, and how-to food videos—all rated and reviewed by millions of home cooks,make the perfect birthday cake, or plan your next holiday dinner. OMG!!!! those look AMAZING!! i CANNOT wait to make this!!! do you think they whey protein powder would work in it? i don’t have any other kind at home,so i was wondering if you think that would work. As for the protein powder, I’m afraid there’s no replacement. I’ve tried using coconut flour instead but it turned out gritty and not fudge-like. Sorry! Am I able to miss out the butter flavour and use maple syrup of blue agave nectar instead? The butter flavor helps cover the beet flavor, and it also gives it that classic “Red Velvet Cake” flavor. I wouldn’t recommend omitting it. Also, the stevia is difficult to replace because it’s a dry ingredient that dissolves quite easily, and 3/4 cup of maple syrup or agave would throw off the liquid:dry ratio. Sorry! 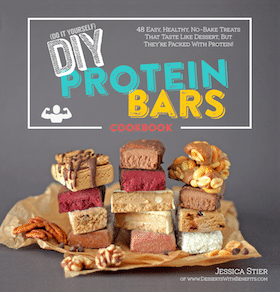 I didn’t see a protein cookie recepie that substituted flour with protein powder. Let me know if one exists. Do I have to use the classic blend or will any blend by Sun warrior create the same product? Eager to make these bars although I can’t find the protein powder anywhere. Also will it matter whether I use vanilla instead of chocolate? I use the classic blend 🙂 (I’ve tried the warrior blend and it doesn’t work at all… it absorbs WAYYY too much liquid). The chocolate is what makes these red velvet, but it won’t hurt too much by using vanilla. Hope you like the recipe! I’ve tried to replace the sunwarrior protein with whey – I wish I had read the comments earlier. So as you mentioned it doesn’t solidify. Do you think I can salvage this mess by adding an egg and baking it? Do I even need an egg? Thanks for the quick reply Jess. So I’ve baked it and it’s very very dry, like one-bite-no-more-saliva dry. Barely edible on its own but it’s allright with coffee or a glass of milk. Aw darn!! It could have been the coconut flour. When I first started baking with coconut flour everything was dry and crumbled like sand. I think brown rice protein powder is just the way to go in my protein bar recipes! These look good and I am hoping to try some of the bars out soon. I know you said in a previous comment that these bars are not designed for long time storage. But how long would you say these would last? I am a stay at home mom to 3 kids ranging from 1 to 7. Needless to say, my time isn’t always available. So I’d like to do one day where I make certain snacks for the week in advance. Would these last, say 5-7 days in the fridge? You can freeze these too if you like! They last about 2 months in the freezer. I hope you like the protein bars! Red Velvet is my favorite and when I saw the healthier version of the fudge, I got excited to make it! But why would you just put the ingredients and not the directions? I understand you got it off a cookbook, but you could still put the directions and just gave them the credit. Such an inconvenience having to buy the cookbook in order to make these. It wouldn’t be fair to the people who purchased my cookbook for those exclusive recipes to be free online. If I bought a cookbook and found the recipes free somewhere else, I’d be pretty upset. Looks delicious. Can’t wait to try recipe. Although nothing I make looks as pretty as yours. I’m not understanding how the protein content is so high. I’ve calculated and recalculated but never seem to get anywhere near the protein content listed here and this is with using higher protein per weight listed in your recipe. Please help. 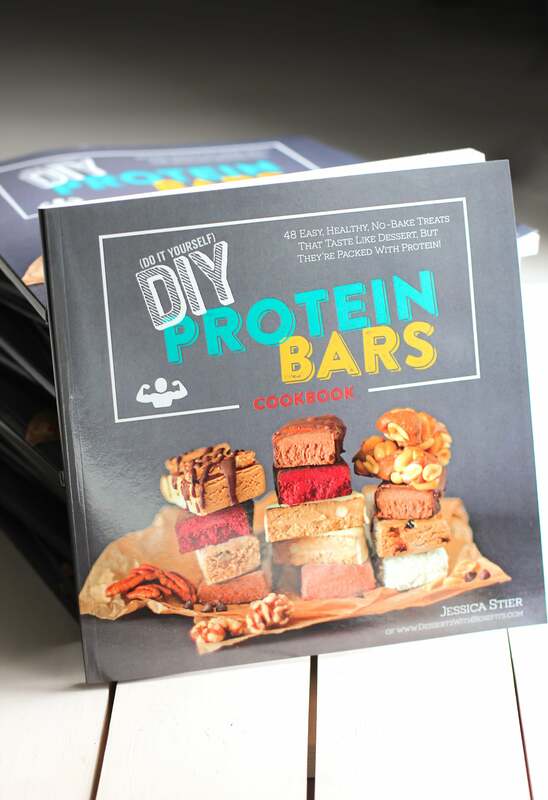 Are you calculating the quantity of protein powder stated in the recipe in the DIY Protein Bars Cookbook? No problem! (answering your last comment, not sure it will post in order)…finally got around to getting the ingredients, sending you an email, so please watch for it! Just realized I had a good number of viewers coming from your site and saw that you added the video to this entry. Thank you for sharing the video, and I’m so glad you liked it!